Instead of giving respite to motorists driving coast-to-coast on Highway 80 in the Southwest, Shady Dell has become a destination for mid-century enthusiasts and those looking to get off the beaten path. BISBEE, Ariz. — Visitors arriving at the neon-illuminated office of the Shady Dell trailer court enter a kind of time warp, transported back to the 1950s when big Studebakers and Chevys rolled up carrying road-weary travelers, their trailers in tow. 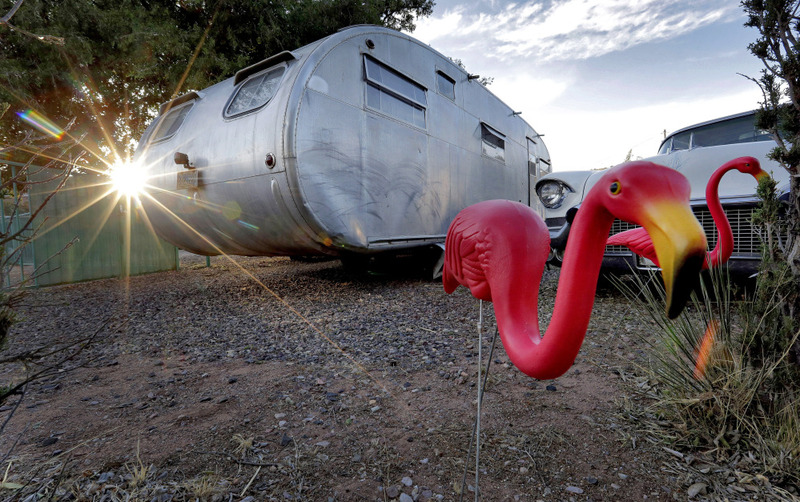 Decades later, that mid-century feeling endures at this southern Arizona tourist stop. 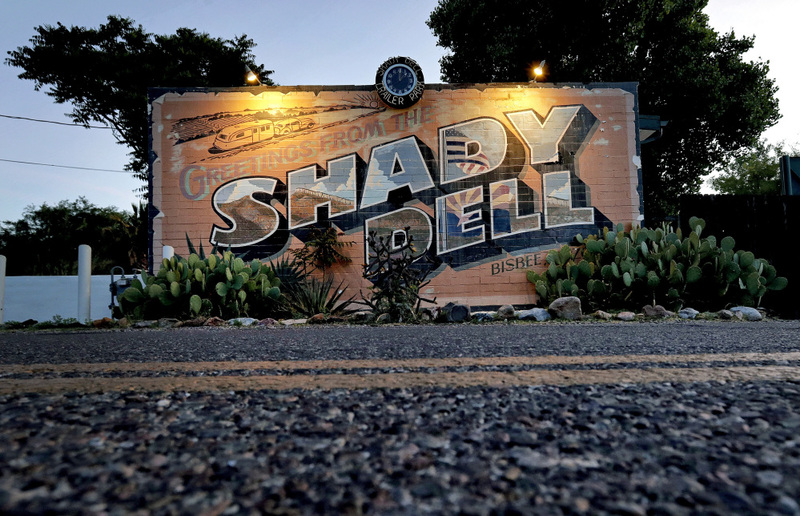 The front office of the Shady Dell trailer court is illuminated at dawn in Bisbee, Ariz., near Highway 80. The rest haven in the tiny mining town was a frequent stop for motorists during the golden age of American automobile travel. The 1953 movie "Cat Women of the Moon" is shown on the big screen at the Shady Dell trailer court. Movies and ads from the 1950s are shown nightly adjacent to the snack bar, with vintage golf carts and automobiles used for seating. Lined inside with warm woods, vintage aluminum travel trailers manufactured under names such as Airstream, Spartan Royal Mansion, Airfloat, Boles Aero and El Rey populate the tidy trailer court with gravel paths and small lawns. But the trailers, rather than the spaces, are for rent, like hotel rooms. The trailer windows glow a soft amber hue after dusk, and tiki torches and neatly hung strings of multicolored lights circle a small bandstand outside. Once-popular songs from 1950s vinyl records crackle over a loudspeaker throughout the park just 10 miles from the U.S.-Mexico border. Similar to its big brother, Route 66, the lesser-known Highway 80 once linked America’s Atlantic and Pacific coasts – in its case, between Savannah, Georgia, and San Diego. Back then, trailer courts lined Highway 80, offering respite to motorists traversing the Southwest’s harsh landscape in the final push to Southern California. The Shady Dell later sat dormant, reopening in 1996 with the idea of reviving its vintage atmosphere. Now the former layover for people traveling long distances has become a destination of its own for vintage enthusiasts and those just looking to get off the beaten path. The trailer park shuts down several months each year for the brutally hot desert summer but reopens as fall nears, coming this year on Friday. Along with various mid-century trailers, a 1947 Chris Craft yacht with V-shaped berth sleeping quarters and a 1947 Airporter bus decked out in 1950s Hawaiian style, have added to the court’s yesteryear charm. All guest rooms come complete with period-correct furnishings. Several have old-fashioned phonographs and black-and-white television sets, but there are no telephones, digital clocks or remote controls. 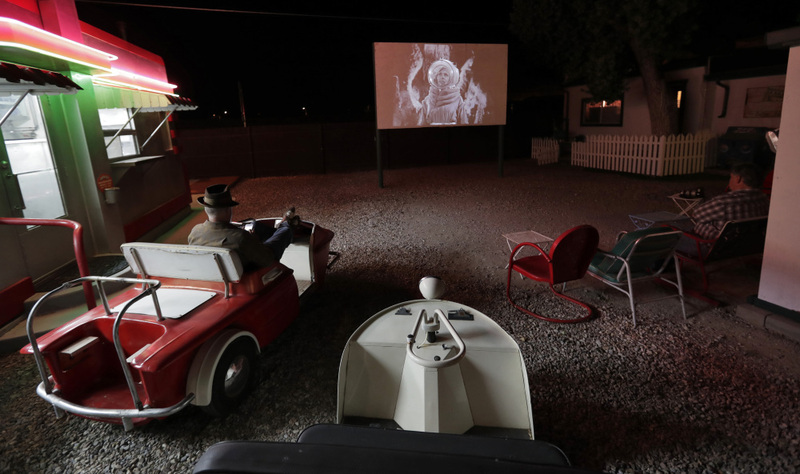 Staying true to the 1950s style, classic films are shown every night at a kind of drive-in theater outside. The outdoor movie, adjacent to a little snack bar, is the perfect nightcap to a relaxing day in Bisbee’s slow lane.